Cake doughnuts have always been a favorite of mine since I was a kid - much more so than fried yeast doughnuts - and getting to have those glazed sour cream cake doughnuts from the grocery store bakery was definitely a treat. This morning I baked a small batch of Vanilla Bean Sour Cream Cake Doughnuts for breakfast in my new doughnut pan, and the doughnuts brought to mind other memories of a house we lived in for a few months in South Carolina. When I was 12, my parents sold our house in South Carolina, and before we moved to Colorado, we were temporarily renting an apartment of sorts in a large house that had been divided into 5 compartments. Since it was a sectioned off portion of a house, the layout was a little odd and there weren't many rooms. The main entrance led into a room that my brother, sister and I slept in on a pull-out couch - I have lots of painful memories of scraping my legs on the sharp hinges of that sofa bed. Off that room was my parents' bedroom / living room. There was one small bathroom we all five shared, a surprisingly huge pantry with high rafters where my mom would try to hide the chocolate chips from my dad, a small eat-in kitchen, and a little room off the kitchen that we used as a closet/dressing room. But it also had a huge covered porch where we would eat dinner on warm summer nights, even when it was pouring rain out. The warm rain misting onto our faces as we ate seemed sort of magical. One day I had stayed home from school sick, although I must not have been that sick, because I remember I was in the kitchen helping my mom with something. I heard a faint squeaking sound, and after hunting around for a few minutes, found a tiny pink baby mouse in the corner of the kitchen - it was so tiny it couldn't have been more than a day or two old. Being the animal lover that I am, I put it in a box with a towel to keep it warm and tried spooning some milk into its mouth. After a while, my mom convinced me that I should put it in the mouse hole under the kitchen sink so that it could find its mommy - of course, my dad boarded up that hole later that night, and I was sad for a few days wondering what became of the mouse. Mice were only one of the problems in that house - we also had the occasional infestation of ants! One morning I walked into the kitchen to see a black line of ants marching across the wall, onto the counter, and swarming all over the butter dish. But that mouse and ant-infested kitchen was where I also remember starting to learn how to cook. If mixing up boxes of muffin mix, instant rice and heating cans of beef stew counts as cooking! But back to the cake doughnuts... On Friday nights, one of our favorite family dinners was nachos with the works, which we called "smachos" (super nachos). And if we were lucky, some ice cream with cake doughnuts for dessert, and sometimes a handful of red hot tamales. We'd all crowd onto my parents' bed, since our only TV was in their room, and watch a movie. Since cake doughnuts are made with a batter that's pretty similar to muffin batter, I decided I could tweak one of my muffin recipes to create a plain vanilla cake doughnut. 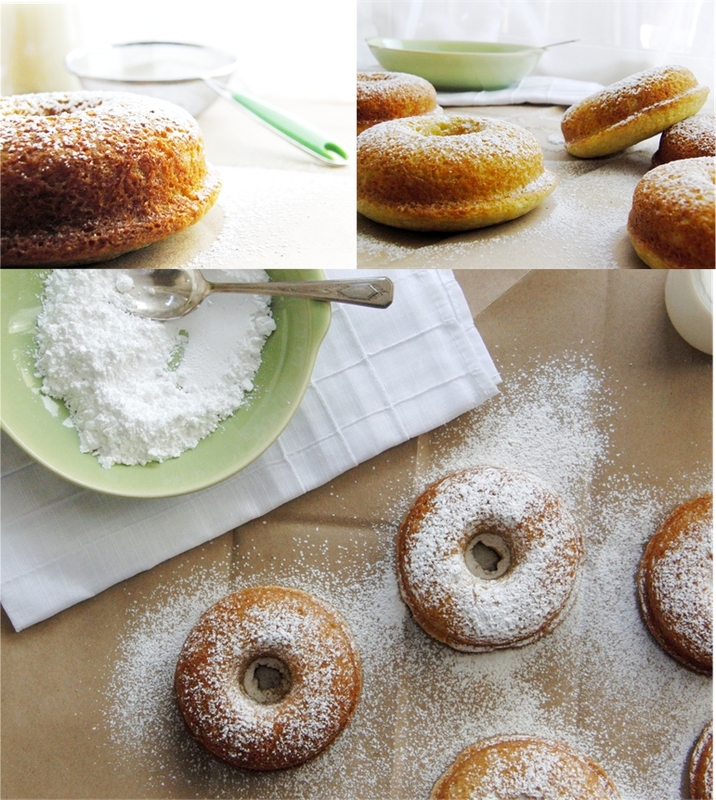 I mixed up a simple batter with lots of fresh vanilla bean, and instead of a thick glaze, just dusted the doughnuts with a little vanilla-infused powdered sugar. They were so light and airy, soft and delicious. For a basic cake doughnut that's simple and very easy to make, this will be a great go-to recipe. I'm looking forward to making some variations in the future with pumpkin, apple and lemon. Although I just dusted these with powdered sugar, they would be amazing dipped in a powdered sugar glaze flavored with lemon or lime zest, or a rich chocolate glaze. On a previous post for yeast doughnuts, I have a few basic glaze recipes. These are just too pretty, aren't they? Preheat the oven to 350. Spray a standard cake doughnut pan with non-stick spray. In a bowl, whisk together the sour cream, sugar, oil, egg, and half of the vanilla bean seeds. In a separate bowl, combine the flour, baking soda, salt and nutmeg. Add dry ingredients to the wet and stir just until combined. Spoon batter into a zip-lock bag. Snip an inch off one of the corners of the bag and pipe the batter into the doughnut pan. Bake for 12-14 minutes until golden and puffy, and a toothpick inserted comes out clean. Cool doughnuts in the pan for 5 minutes then turn out onto a wire rack. Place the powdered sugar and the remaining vanilla bean seeds in a spice grinder or small food processor. Pulse a couple of times to infuse the powdered sugar with the vanilla beans. Dust the doughnuts with the powdered sugar and serve warm.